Surely if you didn't get enough cherry blossoms last weekend then this weekend ought to more than sate the appetite for pink flowers in trees. Early birds will want to head to Kichijoji for the farmer's market as well as to save themselves a prime spot under the blossoms. Folks heading to the Nippori market should take the time to visit Yanaka for a walk through the cemetery there for some spectacular blossom viewing as well. (Pick up some of those yummy manju to munch as you gaze upward into the pink haze...hmmm, now I have an idea for the weekend!) Regardless, get out there to soak up some spring blossoms, some good food, and do your bit for the local economy! 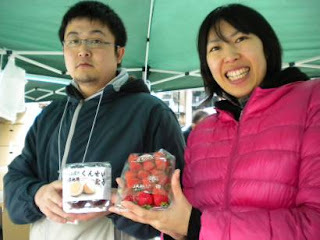 Photo Note: Pictured here are two employees of Aizu Wakamatsu commissioned by their city government to come down and help the farmers and producers selling at the Nippori Market. Ganbatte, Tohoku!